Joseph Edward Cronin (October 12, 1906 – September 7, 1984) was a Major League Baseball (MLB) shortstop, manager and general manager. He also served as president of the American League (AL) for 14 years. During a 20-year playing career, he played from 1926–45 for three different teams, primarily for the Boston Red Sox. Cronin was a major league manager from 1933–47. A seven-time All-Star, Cronin was elected to the Baseball Hall of Fame in 1956. Cronin became the first AL player to become an All-Star with two teams. Cronin was born in Excelsior District of San Francisco, California. The 1906 San Francisco earthquake had cost his Irish Catholic parents almost all of their possessions. Cronin attended Sacred Heart Cathedral Preparatory. He played several sports as a child and he won a city tennis championship for his age group when he was 14. As he was not greatly interested in school, Cronin's grades improved only when the San Francisco Seals of the Pacific Coast League began giving away tickets to students with good conduct and attendance. At the time, the nearest MLB team was nearly 2,000 miles from San Francisco. Baseball promoter Joe Engel, who scouted for the Senators and managed the Chattanooga Lookouts at Engel Stadium, originally signed Cronin. Engel first spotted Cronin playing in Kansas City. "I knew I was watching a great player", Engel said. "I bought Cronin at a time he was hitting .221. When I told Clark Griffith what I had done, he screamed, 'You paid $7,500 for that bum? Well, you didn't buy him for me. You bought him for yourself. He's not my ballplayer – he's yours. You keep him and don't either you or Cronin show up at the ballpark.'" In 1930, Cronin had a breakout year, batting .346 with 13 home runs and 126 RBI. Cronin won both the AL Writers' MVP (the forerunner of the BBWAA MVP, established in 1931) and the AL Sporting News MVP. His 1931 season was also outstanding, with him posting a .306 average, 12 home runs, and 126 RBIs. Cronin led the Senators to the 1933 World Series and later married Griffith's niece, Mildred Robertson. Cronin was named player-manager of the Senators in 1933, a post he would hold for two years. In 1935, he was traded to the Boston Red Sox by Griffith, also as player-manager. 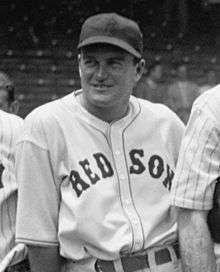 Cronin retired as a player in 1945, but remained manager of the Red Sox until 1947. As early as 1938, it was apparent that Cronin was nearing the end of his playing career. Red Sox farm director Billy Evans thought he had found Cronin's successor in Pee Wee Reese, the star shortstop for the Louisville Colonels of the Triple-A American Association. He was so impressed by Reese that he was able to talk Red Sox owner Tom Yawkey into buying the Colonels and making them the Red Sox' top farm club. However, when Cronin went to scout Reese, Cronin realized that they were asking him to scout his replacement. He deliberately downplayed Reese's talent and suggested that the Red Sox trade him. Reese was eventually traded to the Brooklyn Dodgers, where he went on to a Hall of Fame career. As it turned out, Evans' and Yawkey's initial concerns about Cronin were valid. His last year as a full-time player was 1941; after that year he never played more than 76 games in a season. Over his career, Cronin batted .300 or higher eight times, as well as driving in 100 runs or more eight times. He finished with a .301 average, 170 home runs, and 1,424 RBIs. As a manager, he compiled a 1,236–1,055 record and won two American League pennants (in 1933 and 1946). His 1933 Senators dropped the 1933 World Series to the New York Giants, and his 1946 Boston Red Sox lost the 1946 World Series to the St. Louis Cardinals. At the end of the 1947 season, Cronin succeeded Eddie Collins as general manager of the Red Sox and held the post for over 11 years, through mid-January 1959. The Red Sox challenged for the AL pennant in 1948–49 (finishing second by a single game both seasons) thanks to Cronin's aggressive trades. In his first off-season, he acquired shortstop Vern Stephens and pitchers Ellis Kinder and Jack Kramer from the St. Louis Browns; all played major roles in Boston's contending 1948 season, and Kinder and Stephens were centerpieces of the Red Sox' 1949–50 contenders as well. But the Red Sox began a slow decline during the 1950s and did not seriously contend after 1950. 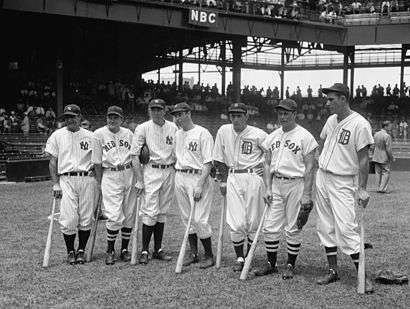 With the exception of Ted Williams (who missed most of the 1952–53 seasons while serving in the Korean War), the 1946–50 core of the team aged quickly and the Red Sox faced a significant rebuilding job starting in 1952. Cronin's acquisition of future American League Most Valuable Player Jackie Jensen from Washington in 1954 represented a coup, but the club misfired on several "bonus babies" who never lived up to their potential. Most attention has been focused on Cronin and Yawkey's refusal to integrate the Red Sox roster; by January 1959, when Cronin's GM term ended, the Red Sox were the only team in the big leagues without an African-American or Afro-Caribbean player. Notably, Cronin once passed on signing a young Willie Mays and never traded for an African-American player. The Red Sox did not break the baseball color line until six months after Cronin's departure for the AL presidency, when they promoted Pumpsie Green, a utility infielder, from their Triple-A affiliate, the Minneapolis Millers, in July 1959. In January 1959, Cronin was elected president of the American League, the first former player to be so elected and the fourth full-time chief executive in the league's history. When he replaced the retiring Will Harridge, who became board chairman, Cronin moved the league's headquarters from Chicago to Boston. Cronin served as AL president until December 31, 1973, when he was succeeded by Lee MacPhail. During Cronin's 15 years in office, the Junior Circuit expanded from eight to 12 teams, adding the Los Angeles Angels and expansion Washington Senators in 1961 and the Kansas City Royals and Seattle Pilots in 1969. It also endured four franchise shifts: the relocation of the original Senators club (owned by Cronin's brother-in-law and sister-in-law, Calvin Griffith and Thelma Griffith Haynes) to Minneapolis–Saint Paul, creating the Minnesota Twins (1961); the shift of the Athletics from Kansas City to Oakland (1968); the transfer of the Pilots after only one season in Seattle to Milwaukee as the Brewers (1970); and the transplantation of the expansion Senators after 11 seasons in Washington, D.C., to Dallas–Fort Worth as the Texas Rangers (1972). The Angels also moved from Los Angeles to adjacent Orange County in 1966 and adopted a regional identity, in part because of the dominance of the National League Dodgers, who were the Angels' landlords at Dodger Stadium from 1962–65. Of the four expansion teams that joined the league beginning in 1961, three abandoned their original host cities within a dozen years (the Pilots after only one season), and only one team—the Royals—remained in its original municipality. Two of the charter members of the old eight-team league, the Chicago White Sox and Cleveland Indians, also suffered significant attendance woes and were targets of relocation efforts by other cities. In addition, the AL found itself at a competitive disadvantage compared with the National League during Cronin's term. With strong teams in larger markets and a host of new stadiums, the NL outdrew the AL regularly; in 1973, Cronin's final season as league president, the NL attracted 55 percent of total MLB attendance, 16.62 million vs. 13.38 million total fans, despite the opening of Royals Stadium in Kansas City and the American League's adoption of the designated hitter rule, which was designed to spark scoring and fan interest. While the National League held only an 8–7 edge in World Series play during the Cronin era, it dominated the Major League Baseball All-Star Game, going 15–3–1 in the 19 games played from 1959–73. Joe Cronin's number 4 was retired by the Boston Red Sox in 1984. Joe Cronin was inducted into the Baseball Hall of Fame (with Hank Greenberg) in 1956. In the last months of his life, Cronin struggled with cancer that had invaded his prostate and bones; he suffered a great deal of bone pain as a result. Cronin came to Fenway Park for one of his last public appearances when his jersey number 4 was retired by the Red Sox on May 29, 1984. He died at the age of 77 on September 7, 1984, in Osterville, Massachusetts. He is buried in St. Francis Xavier Cemetery in nearby Centerville. At the number retirement ceremony shortly before Cronin's death, teammate Ted Williams commented on how much he respected Cronin as a father and a man. Cronin was also remembered as a clutch hitter. Manager Connie Mack once commented, "With a man on third and one out, I'd rather have Cronin hitting for me than anybody I've ever seen, and that includes Cobb, Simmons and the rest of them." In 1999, he was named to the Major League Baseball All-Century Team. ↑ Corcoran, Dennis (2010). Induction Day at Cooperstown: A History of the Baseball Hall of Fame Ceremony. McFarland. p. 68. ISBN 0786444169. ↑ Armour, Mark. "Joe Cronin". Society for American Baseball Research. Retrieved 16 July 2016. ↑ Rosen, Charley (2012). The Emerald Diamond: How the Irish Transformed America's Favorite Pastime. HarperCollins. ISBN 0062089919. ↑ "Joe Cronin, baseball legend, American League president". The Morning Call. September 8, 1984. Retrieved November 29, 2014. ↑ "Joe Cronin, an ex-executive and star player in baseball". The New York Times. September 8, 1984. Retrieved November 29, 2014. ↑ "The All-Century Team". MLB.com. Retrieved October 31, 2013. Armour, Mark (2010). Joe Cronin: A Life in Baseball. University of Nebraska Press. ISBN 0803229968. Wikimedia Commons has media related to Joe Cronin.